Spain is famous for its Fiestas, with each region and town celebrating the history and traditions with passion and enthusiasm. Check with your local tourist office the dates to be sure not to miss any of the spectacular processions and firework displays. Here we have listed just a few of the most famous and celebrated fiestas of Spain. 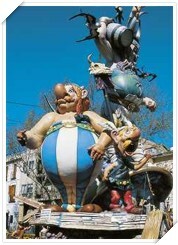 For the towns and villages within the Valencian Region Fallas is widely celebrated. It is dedicated to St Joseph, the patron saint of Carpentry. The celebrations take place from 15th-19th March annually; towns and cities are decorated with papier mache figures, sometimes as high at 20 feet. The highlight of the Fallas is the final burning of the effigies. Within seconds of lighting, the effigies which have taken many months of work, are burnt to the ground. Followed by a spectacular fireworks display. The order of burning depends on the judging results, with the first prize being the last burnt. This always takes place on the final day. Another highlight of the Fallas is the daily mascleta, a mass of rocket, firework explosions and firecrackers lasting up to 20 minutes… not for the faint hearted! 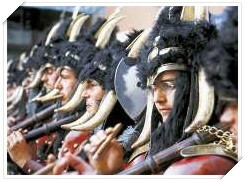 The largest of celebrations taking place in the city of Valencia itself where spectators visit from miles around. 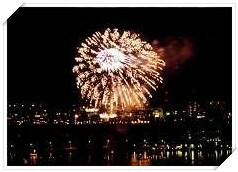 One of Spains Most explosive fiestas! This festival commemorates a famous battle held in Alcoy, (28km north of Alicante) in 1276 between the Christian ruler and the Moorish captain Al Athrak. The story goes that on the point of losing the city to the Moors, St. George appeared on a white charger and turned the Christians' fate around. The proceedings have changed little for 700 years, closely following the sequence of events recorded immediately after the battle: the Moors seize the castle in the morning and the Christians win it back again in the afternoon. The armies parade to the sounds of dramatic music through the streets. Although no effort is made to achieve strict historical accuracy in the clothes, plenty of attention is given to the details, and the costumes have to follow certain rules. Some modern things are allowed, like eyeglasses and watches, and most of the soldiers, even non-smokers, chomp on cigars. These cigars are a tradition of the fiesta, although nobody seems to know exactly why - "They're just part of the fun". Moors and Christians truly is a spectacular fiesta, that shouldn't be missed. Semana Santa in Spain is an experience that will move you;. The religious traditions in Spain dominate this special week, with thousand of processions though out the Country, from the smallest of villages to the major cities, with the country celebrating life itself. Become a part of this celebration, spectate at the many processions, rein acting the pain of Christ and the sorrow of the Virgin. San Juan Celebrated along the Coast from Valenica to Alicante on 23rd/24th June, bonfires are lit on the beach, music is played and danced to under the moonlight, swimming into the early hours of the morning,. The largest celebration takes place annually in Alicante, although the smaller of the coastal towns celebrate with style on a smaller scale. Where ever you are you will see the night skys are alight.